(a) the Chief Judge of the Federal Capital Territory, Abuja who shall be the Chairman. (f) one other person, not being practitioner, who in the opinion of the President is of unquestionable integrity. (vi) a Judge of the Customary Court of Appeal of the Federal Capital Territory, Abuja. 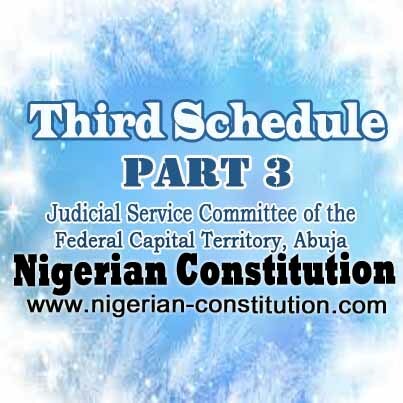 (c) to appoint, promote and exercise disciplinary control over the Chief Registrar and Deputy Chief Registrars of the High Court, the Sharia Court of Appeal and the Customary Court of Appeal of the Federal Capital Territory, Abuja, magistrates, the judges and members of the District and Area Courts of the Federal Capital Territory, Abuja, if any, and all other members of the staff of the judicial service of the Federal Capital Territory, Abuja not otherwise specified in this Constitution and of the Judicial Service Committee of the Federal Capital Territory, Abuja.